The WebBrowser control enables you to bring in content from existing web applications. In my example today I’ll show how to launch a web page with a dynamically altered link. In my example I’ll use a textbox as the source but it could just as well be the CurrentItem of a M3 List or another Mashup Control. The mashup does a Bing search. 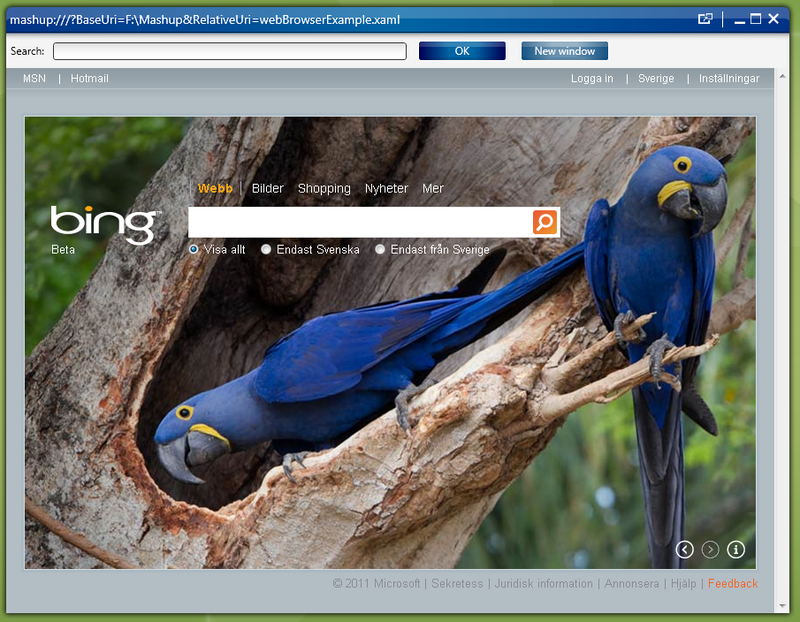 It can do the search within the Mahup using the WebBrowser mashup control or it can launch the Bing page in a new window. Start with adding the TextBox and the two Buttons. Notice that the first button send an event to the targetName webBrowser. webBrowser is the name of my webBrowser control on the mashup page. It has no TargetEventname specified becuase Navigate is the default event so you don’t need to set an EventName. The event has a parameter called search. Now look at the New window button. In that button I use the Event with support for launching an Uri by setting the LinkUri property. The LinkUri property also supports substitution with event values. This entry was posted in Mashup on September 19, 2011 by Karin Portillo. No, there is no markup extension or other way to do specific stuff depending on role or group. Or there is a way but only to check if the user is a LSO Administrator and that is not what you want. This is an area were we can improve but we rely on functionality to be available in the grid. Perhaps in coming versions…. Hello Karin – Our 13.4 H5 installation is using HTTPS. I have a desire to display the following URL http://www.fedex.com/Tracking within a mashup WebBrowser component. The web browser will not show the web page due to it being HTTP. Is there a property that we can use in the Mashup to tell it that the URL is safe? No this is a security restriction in the browser itself. You can’t show that in-line. BUT the fedex site has https support! Just change the protocol to https. But it is possible that they are using headers to prevent their site to be in an iframe. In that case the only option is to launch the site separately.